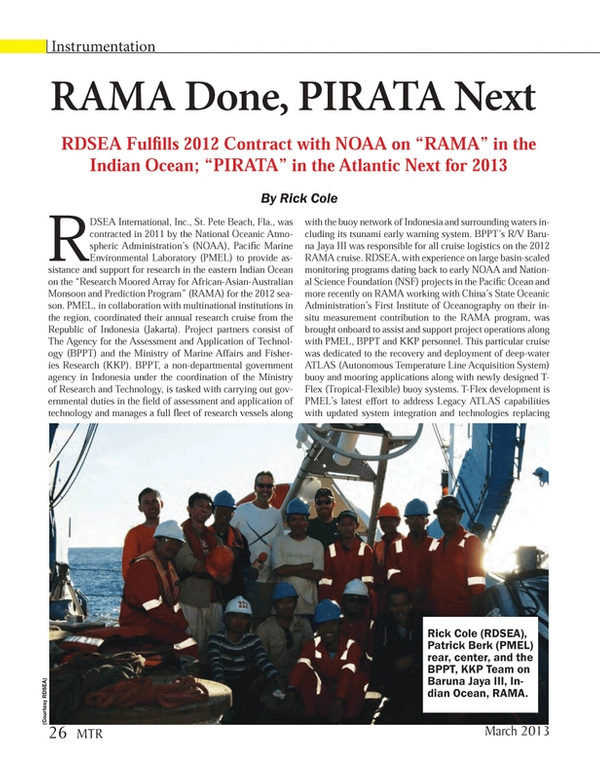 RDSEA International, Inc., St. Pete Beach, Fla., was contracted in 2011 by the National Oceanic Atmospheric Administration’s (NOAA), Pacific Marine Environmental Laboratory (PMEL) to provide assistance and support for research in the eastern Indian Ocean on the “Research Moored Array for African-Asian-Australian Monsoon and Prediction Program” (RAMA) for the 2012 season. PMEL, in collaboration with multinational institutions in the region, coordinated their annual research cruise from the Republic of Indonesia (Jakarta). Project partners consist of The Agency for the Assessment and Application of Technology (BPPT) and the Ministry of Marine Affairs and Fisheries Research (KKP). BPPT, a non-departmental government agency in Indonesia under the coordination of the Ministry of Research and Technology, is tasked with carrying out governmental duties in the field of assessment and application of technology and manages a full fleet of research vessels along with the buoy network of Indonesia and surrounding waters including its tsunami early warning system. BPPT’s R/V Baruna Jaya III was responsible for all cruise logistics on the 2012 RAMA cruise. RDSEA, with experience on large basin-scaled monitoring programs dating back to early NOAA and National Science Foundation (NSF) projects in the Pacific Ocean and more recently on RAMA working with China’s State Oceanic Administration’s First Institute of Oceanography on their in-situ measurement contribution to the RAMA program, was brought onboard to assist and support project operations along with PMEL, BPPT and KKP personnel. This particular cruise was dedicated to the recovery and deployment of deep-water ATLAS (Autonomous Temperature Line Acquisition System) buoy and mooring applications along with newly designed T-Flex (Tropical-Flexible) buoy systems. T-Flex development is PMEL’s latest effort to address Legacy ATLAS capabilities with updated system integration and technologies replacing some PMEL produced sensors with those commercially available. Telemetry is via the Iridium network which allows the transmission of higher resolution data streams. With NOAA’s Tropical Atmosphere Ocean (TAO) program combining efforts in the Pacific with the Japan Agency of Marine-Earth Science and Technology to form the TAO/TRITON array, RAMA in the Indian Ocean and the “Prediction and Research Moored Array” (PIRATA) research in the Atlantic Ocean, the “Global Tropical Moored Buoy Array” (GTMBA, Fig. 2) was created, all large ocean basin monitoring systems. RAMA, a subcomponent of the “Indian Ocean Observing System,” the youngest of the arrays has an emphasis on the role of the ocean for prediction of the Asian Monsoon, Indian Ocean Dipole and El Nino Southern Oscillation, all contributing factors to global climate. This research will also benefit many outside the Indian Ocean region due to the atmospheric connections that influence surrounding nations. Additionally, data collected will contribute to improve forecasting of tropical cyclones and storm surge. Continued science and technology transfer to the Indian Ocean rim countries helps establish observing capabilities in the region and to promote programs to better understand their role in the global climate system. Fig. 3 displays the spring 2012 cruise track of Baruna Jaya III along the 90º and 93º East measurement lines of RAMA. Two legs were scheduled due to logistical constraints, departing Cilegon, Java in mid-April and arriving Banda Aceh on Sumatra in early May. Banda Aceh is now known as “ground zero” for the 2004 tsunami that devastated Indonesia and the surrounding region. Three sites were visited on leg one; south of the equator at 11º, on the equator, 0º and north at 1º. Leg-2 consisted of more site visits in the north at 3º and 8º. Ancillary projects were also carried out on this cruise such as CTD casts at various locations along the cruise track and Argo float and drift buoy deployments. The Argo program is a carry-over from the World Ocean Circulation Experiment of the 1990s and provides a quantitative description of the changing state of the upper ocean and the patterns of ocean climate variability from months to decades. Argo builds upon other upper-ocean observing networks, extending their coverage, depth range and accuracy, enhancing them through the addition of salinity and velocity measurements. The final array of 3,000 floats will provide 100,000 temperature/salinity profiles and velocity measurements per year distributed over the global oceans at an average 3º spacing. The floats cycle to 2,000m depth every 10 days, with four to five year lifetimes for individual instruments. All Argo data are publically available in near real-time via the Global Data Assembly Centers in Brest, France and Monterey, Calif. after an automated quality control check and in scientific quality form, delayed mode data is available within six months of collection. The program has reportedly just reached a milestone of collecting and recording its millionth ocean profile. NOAA’s drift buoy program is managed in Miami, Fla. at the Atlantic Oceanographic and Meterological Laboratory (AOML), Drifter Operations Center. Using research vessels, Volunteer Observation Ships and aircraft, Lagrangian drifters are placed in areas of interest around the world’s oceans. Once verified operational, they are reported to AOML’s Drifter Data Assembly Center. Incoming data from the drifters are then placed on the Global Telecommunications System for distribution to meteorological services everywhere. Preparations are now underway for the beginning of the 2013 field season on RAMA with all agencies planning logistics and cruise tracks for system cycling and new site installations, moving forward to completing the RAMA array. 2013 brings new adventure for RDSEA and more support to the GTMBA network having been invited on PIRATA in the Atlantic with The Oceanographic Institute of the University of Sao Paulo, funded to contribute to research, observation and modeling of the impacts of climate change on the South Atlantic. An important component of the Brazilian observational program is the PIRATA Project which has been monitoring the tropical Atlantic over a decade in collaboration with France and the U.S. The IOUSP has developed their version of an ATLAS-like buoy system (similar to the designs on the GTMBA) that will enhance their research needs on the deployment and management of current meter arrays across the Brazil Current, in the Southeastern Brazilian Bight (22ºS to 28ºS). The first of these buoys, Guariroba, is being tested now locally and will be deployed near 28°S and 42°W on an early spring cruise in 2013 initiating the “ATLAS-B” Project. The Guariroba buoy will provide valuable information for understanding variability of the atmospheric South Atlantic Convergence Zone. Cruise logistics will be handled on board R/V Alpha Crucis (formerly known as R/V Moana Wave, University of Hawaii, an old friend to RDSEA).